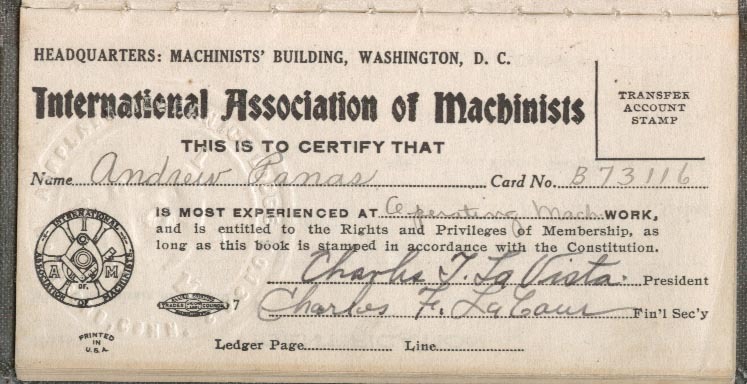 International Association of Machinsts, Machinists' Building, Washington, D. C. This is to certify that Andrew Panas, Card No. B73116, is most experienced at Operating Mach. work, and is entitled to the Rights and Privileges of Membership, as long as this book is stamped in accordance with the Constitution. Are you looking for PANAS ancestors? If so, we suggest posting a query to our Community Message Board to get assistance from other researchers.